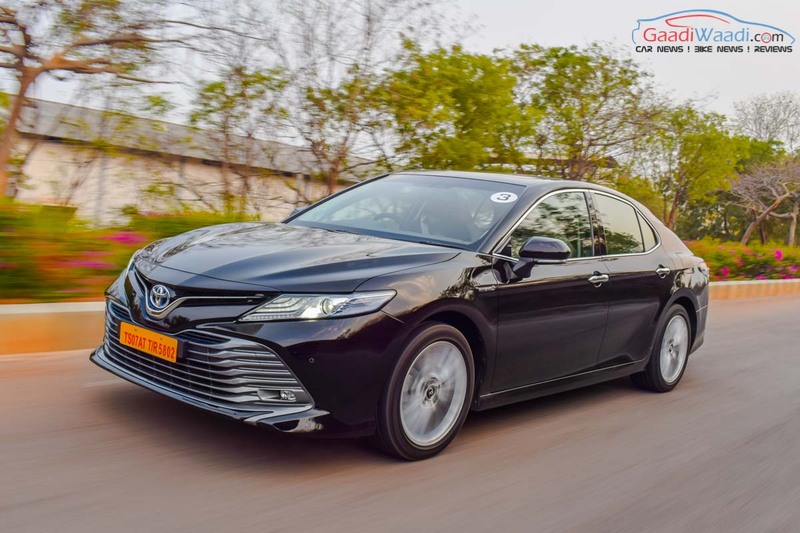 We got behind the wheel of the new generation Toyota Camry Hybrid to tell you whether it is worth buying or not! 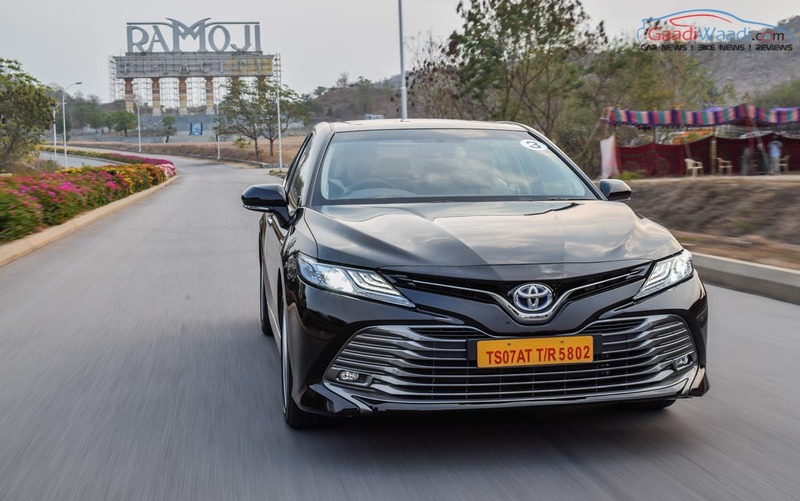 Toyota Kirloskar Motor debuted the Camry nameplate back in 2002, nearly five years after the company’s local operations were founded, and it has constantly evolved through different generations. 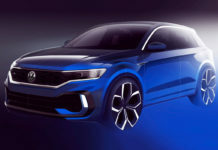 The globally popular sedan saw its latest iteration introduced back in 2017 at the Detroit Auto Expo before going on sale in international markets. 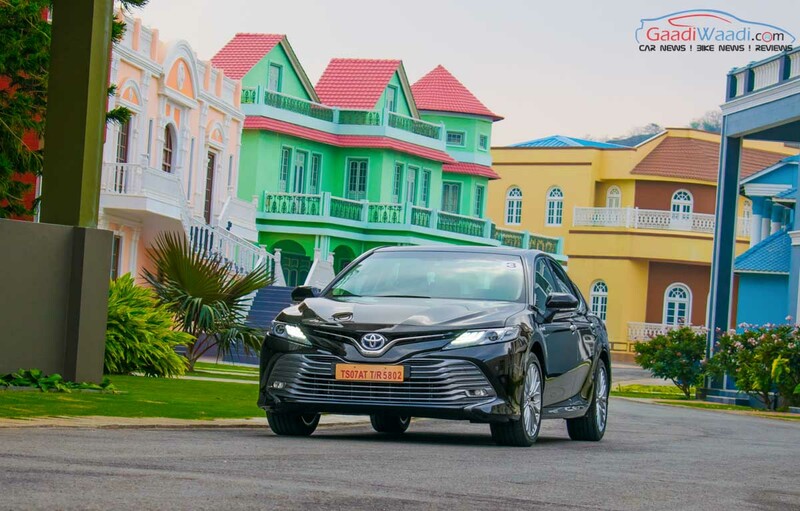 The eighth generation Toyota Camry has an adorable road presence and the grown-up looks help in instant recognition of it being the flagship premium sedan. 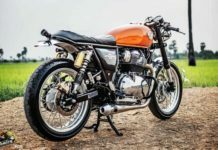 It has a definitive attraction for the young band of customers unlike the previous model and that’s a big overall advantage. 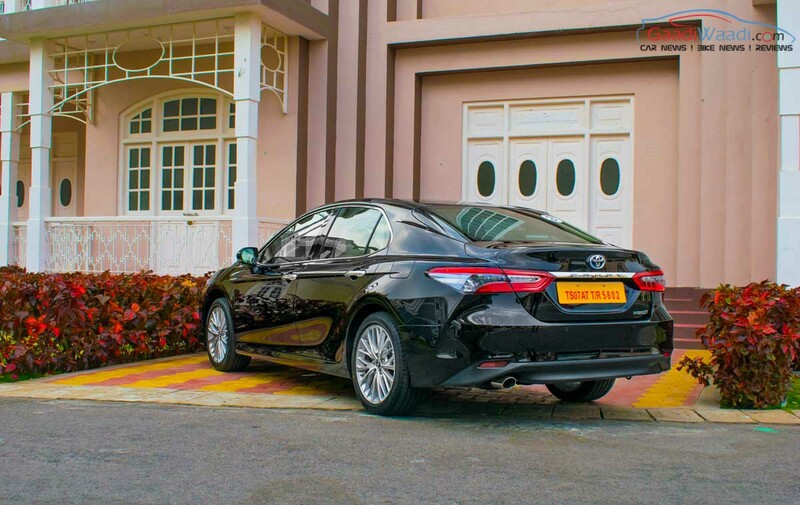 The cosmetic upgrades are complemented by the bigger proportions due to the new TNGA platform as the Camry has become wider and lower slung. 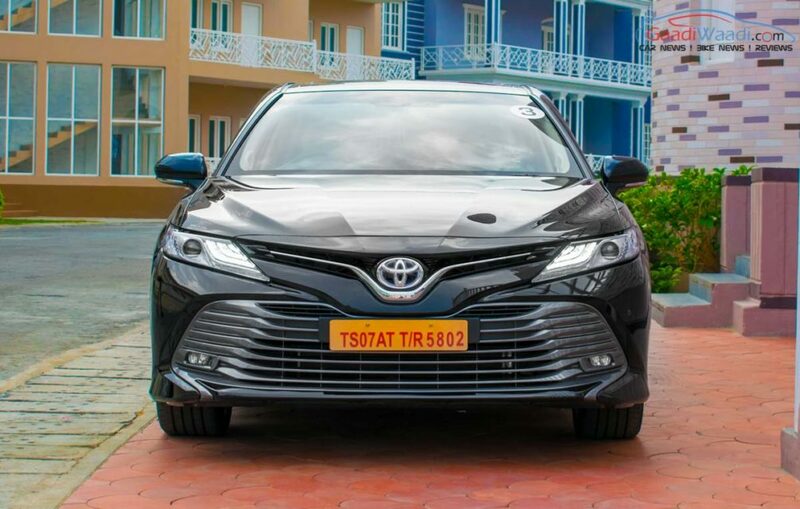 The facade has a prominent V-shaped chrome grille connecting the LED headlamps with integrated LED DRLs while the signature Toyota badge is positioned in the middle with blue accents signifying the sedan’s eco-friendly nature. The grille shutter is present behind the lower grille to improve fuel economy and engine warm-up time. The biggest visual highlight is the multiple horizontal louvres occupying the bumper section with the lower edge having a sweeping profile culminating in thick surfaces to channel air along the body. 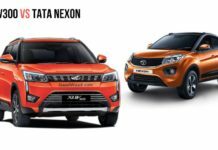 The exterior design evolution is accompanied by two new colour schemes namely Burning Black and Red Mica apart from five other shades. 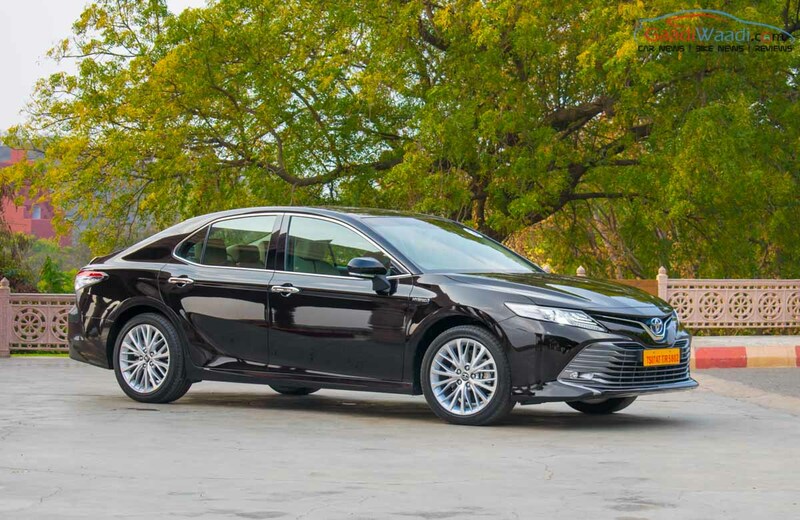 In fact, the new Camry Hybrid is aerodynamically more efficient with low drag coefficient. 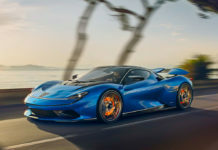 The slightly bulged bonnet and associated character lines along with repositioned wing mirrors with sleeker finish have aesthetic as well as aero importance. 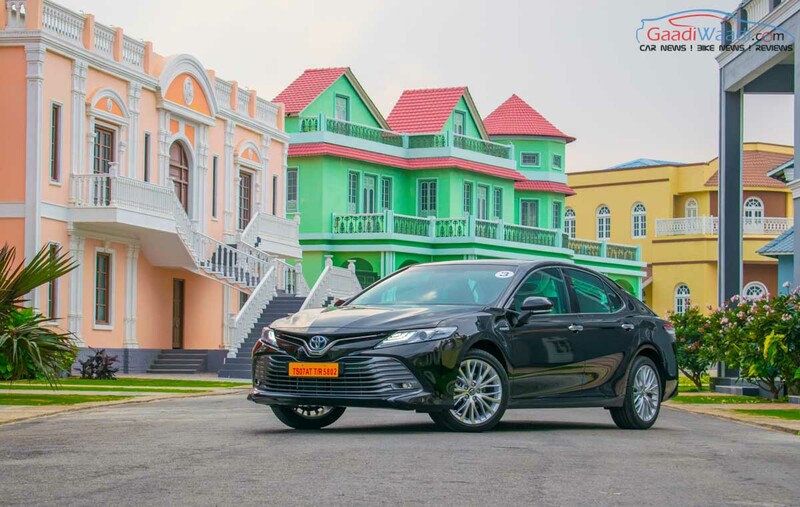 The side profile has raising beltline and chrome door handles, and the 2019 Camry runs on elegantly put together 18-inch aluminium multi-spoke wheels (one size bigger than previous model). 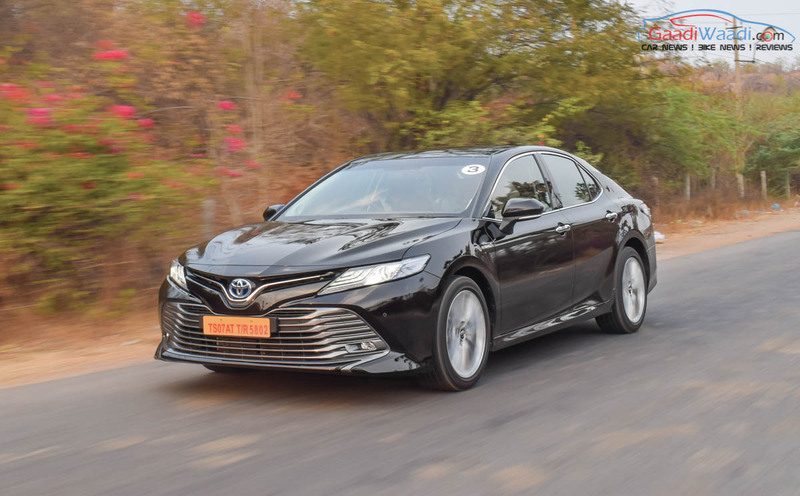 The rear end is 20 mm wider and has striking horizontal LED combination tail lamps that really come alive at night and is a big departure from the rather subtle unit of its predecessor with single exhaust tip on the left side and not on the right as old Camry. The muffler moved to the left is to liberate more luggage space. 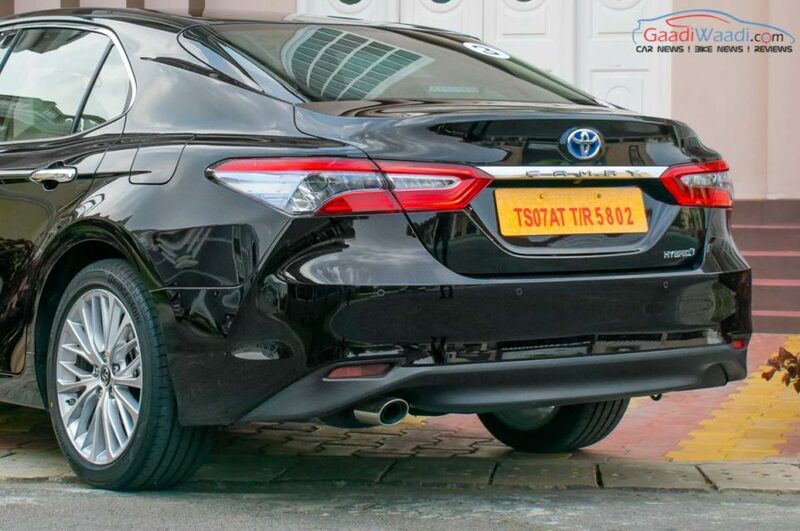 The boot lid protrudes into the curvy spoiler and the chrome applique has Camry name written on it. Interior And Features: Good Place To Be! 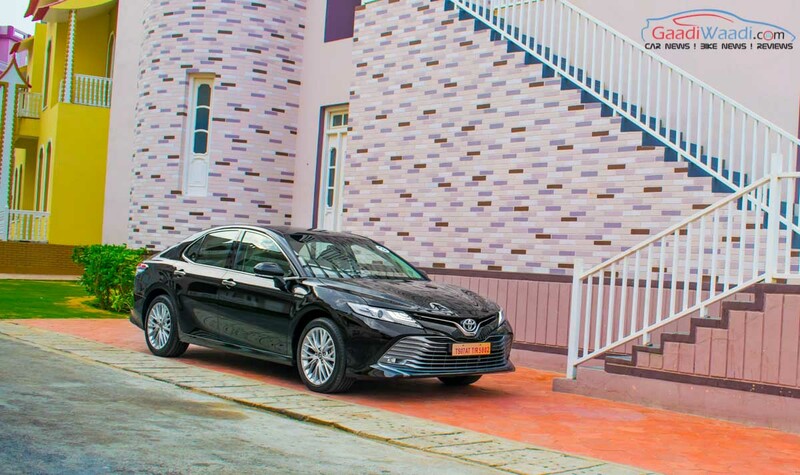 While the low centre of gravity has aided the Camry in becoming a better handling machine, the raked pillars and low-slung roofline, which are part of the aerodynamic progression of the sedan, have impacted the interior in the areas of getting in and out as it could be cumbersome for middle-aged people and you would really have to reach out to have the doors closed. The newly installed operative buttons and dials are intuitive in nature while the specifically-developed 9-speaker JBL audio system puts a big grin on the face, as it has Clari-Fi technology to optimise the output no matter what the playback source is and enhances its quality. The beige leather upholstery bodes well with the metallic accents and stone grain interior garnish while the moonroof can tilt and slide giving a sense of open-air feel to your children. 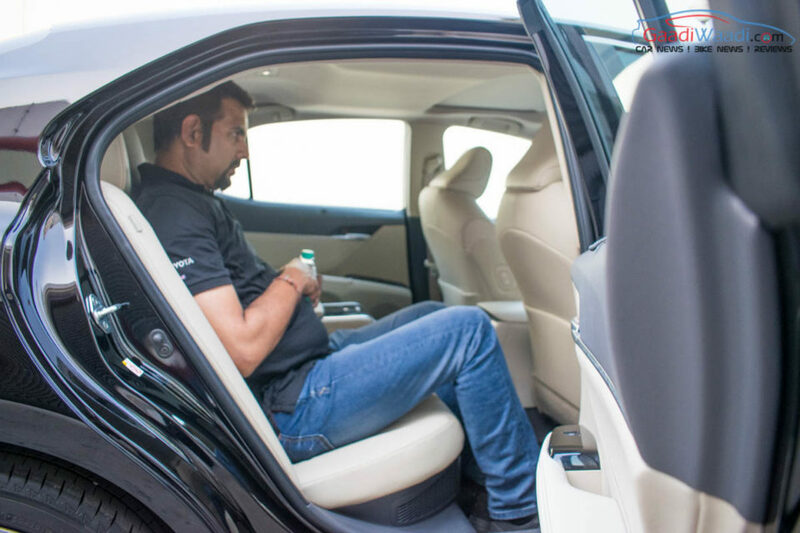 The driver and front passenger seats are the best places to be as they provide ventilation and ten-way power adjustment with lumbar support. The memory function for steering position, ORVM and driver is a nice addition in my opinion. 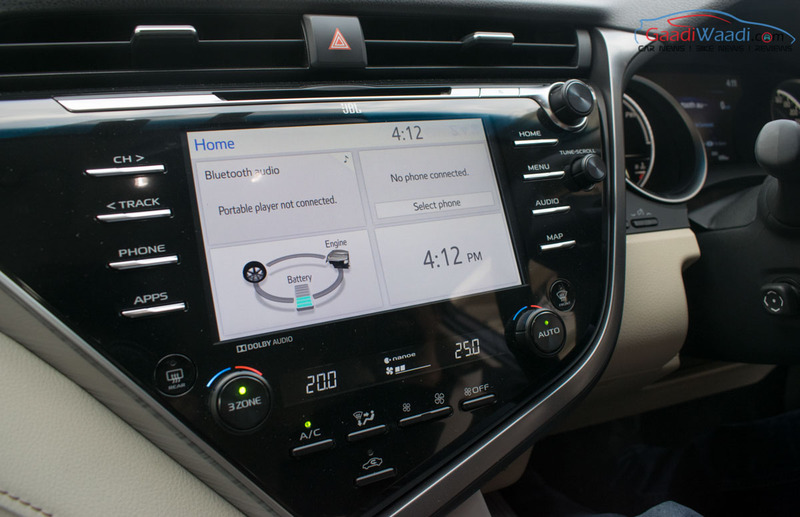 For the first time, the Camry gets an electronic parking brake with brake hold and they do make a difference in the parking situations as well as climbing up the road mainly while not using the paddle shifters. 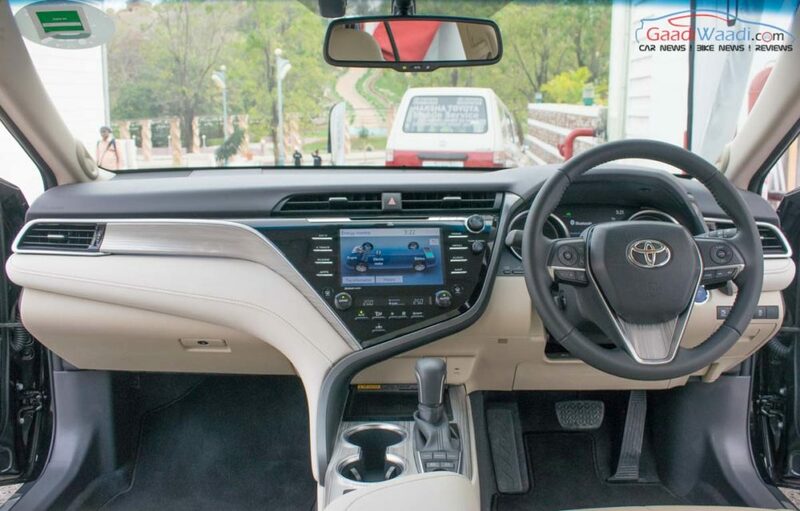 A suite of safety and driver assistive systems are offered including park assist, nine airbags, ABS with EBD, switchable VSC and TC, TPMS and ISOFIX child mounts among others. 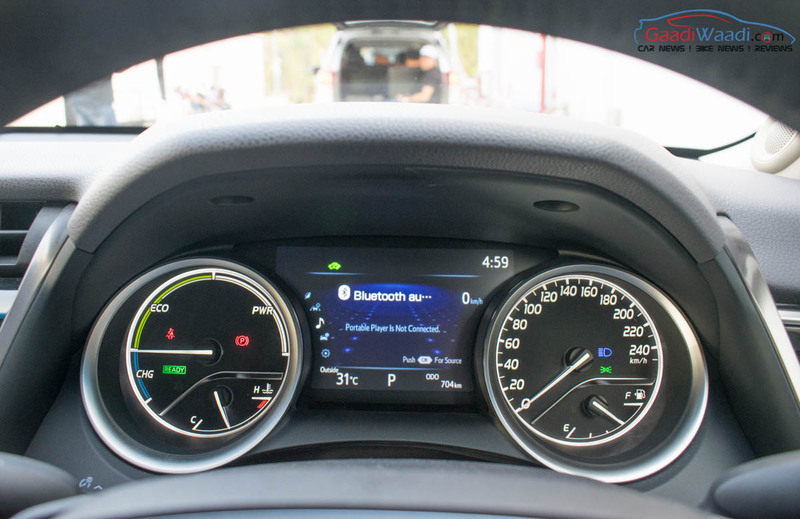 The seven-inch multi-information display provides necessary information about the hybrid wizardry as well as other functions and is placed between the two pods – one for typical analogue speeds and fuel indication while the other shows whether we run on charge, economy state or power depending on the throttle input to keep us in line with the fuel consumption. The bigger eight-inch touchscreen infotainment is very responsive and the ten-inch HUD can be found at the base of the windshield clearly showing speed and navigation. 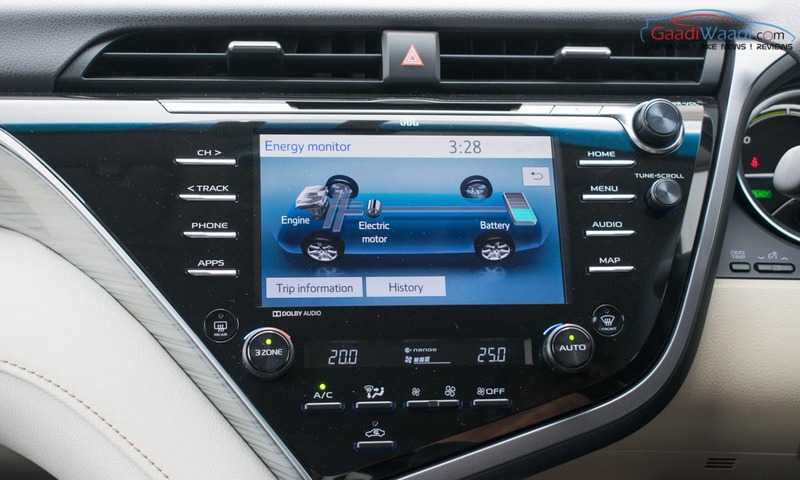 The blue illuminated HUD can be adjusted based on the driver’s seating position while the three-zone automatic climate control system compounds the comfort factor of the Camry Hybrid, and spreads the chilled air across the cabin fast when required. It also features wireless Qi charging facility and resistive touchscreen in the rear armrest for changing audio and other functions. The rain sensing wiper with expanded wiping area is a piece of handy equipment. The use of many buttons could have been avoided on the dash that comprises of rich finishes and textures. The capacitive flush-type touchscreen in the rear armrest is another new feature and it can control the entertainment system. The cockpit does feel compact and the lowered bonnet provides better view of the front. The repositioned ORVMs, from pillar to doors, and lowered widow lines offer better road visibility for the driver as well as occupants. The rear seats have the reclining function but the comfort levels could have been more improved in my opinion. 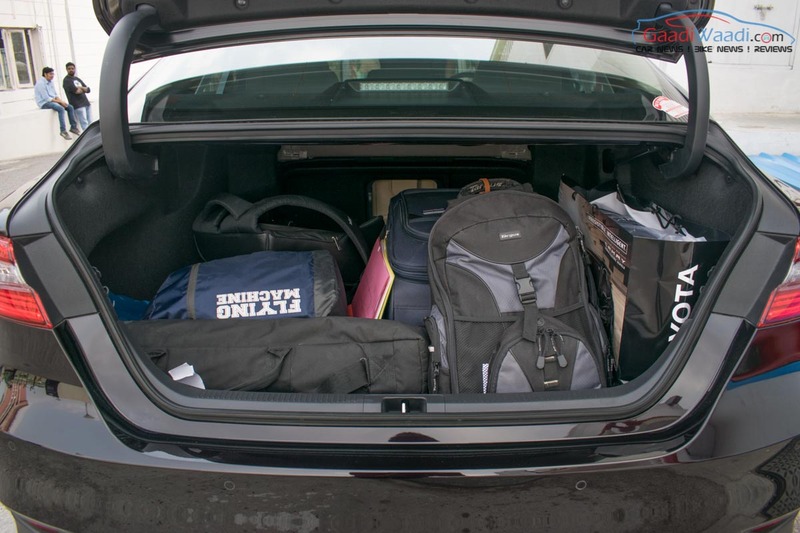 For a six-feet guy, there is sufficient headroom but the thigh support could have gotten better as the battery location shifting from the luggage area to underneath the rear seat might have had an impact. Additionally, the adjustable headrests allow for decent support but I inferred that the seats itself are too deeper when not reclined causing discomfort during long journies. The repositioned battery enables more accessible bootspace which has its overall volume increased by 10 litres. 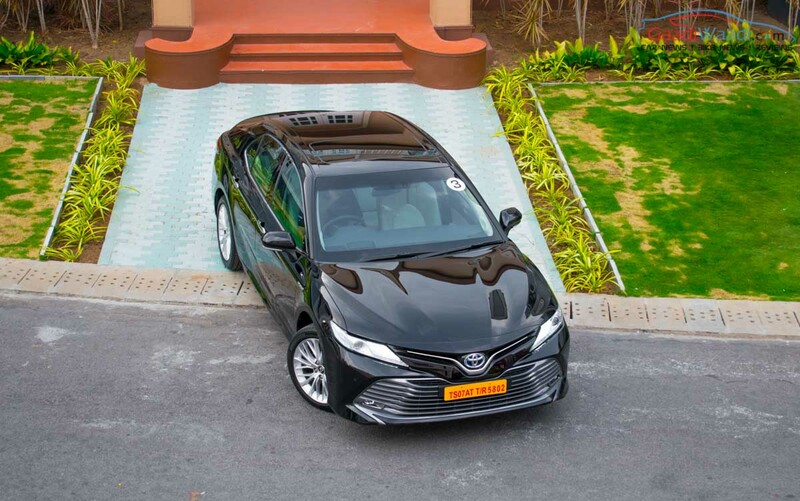 The Japanese auto major has introduced the fourth generation hybrid system in the new-gen Camry with Nickel-metal hydride battery pack mounted under the seat for lower centre of gravity. 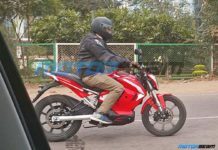 The thermal efficiency of the system has been improved to 41 per cent while the 88 kW compact permanent magnet synchronous electric motor has lesser friction. 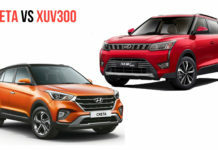 On the IC engine side, the 2.5-litre four-cylinder VVT-i inline Dynamic Force unit working on Atkinson cycle has its components tweaks for optimum performance while the multi-inlet ports, air-fuel mixture flow and combustion have all been completely re-engineered. It produces 178 PS at 5,700 rpm and 221 Nm at 3,600-5,200 rpm. 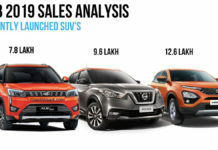 The combined power output stands at 218 PS as the more powerful petrol-hybrid system is also 20 per cent more fuel efficient with the claimed figure of 23.27 kmpl as opposed to 19.27 kmpl in the outgoing model. Power is fed to the wheels through a six-speed CVT sequential shifter that works almost intuitively. 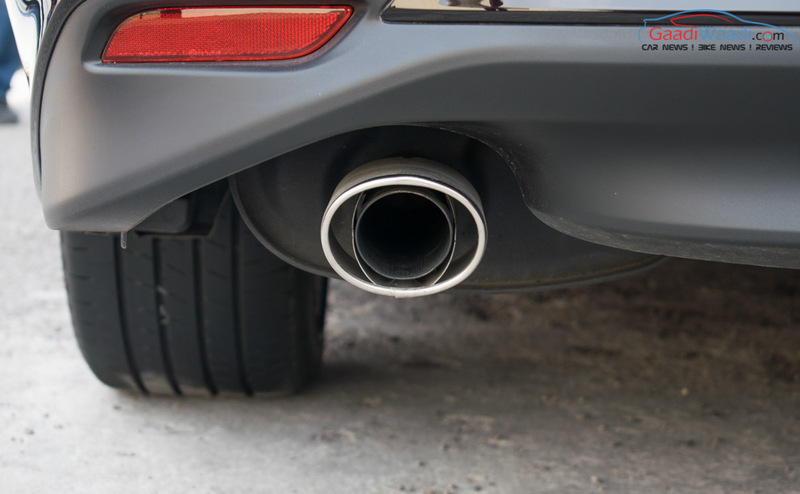 Due to the newer engine mounts and reduced internal vibration, the cabin has got a lot quieter and the NVH levels have improved. 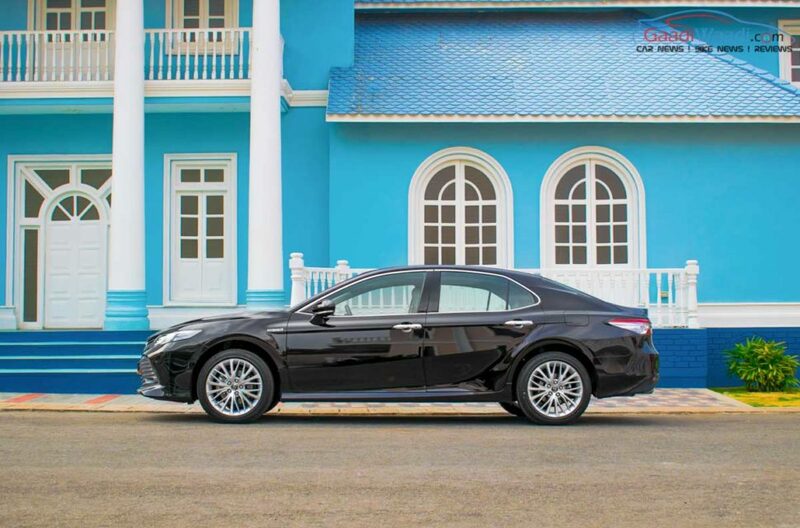 The all-new lightweight TNGA-K architecture has made the Camry Hybrid more lively and vibrant. 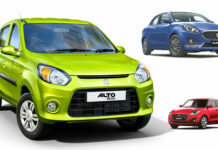 The lower centre of gravity aided by the reduced bonnet height and seat height have positive effect on the way it drives. For instance, you can feel the enormity of the sedan, typical to this segment, only while gazing from the outside. 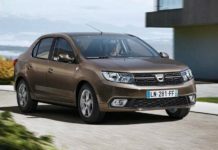 It gives an instant compact feel when you step inside and take the steering wheel that can be tilt and telescopic adjusted. The grippy leather-wrap does not make the steering wheel uncomfortable and the integrated buttons are not cluttered by any means. 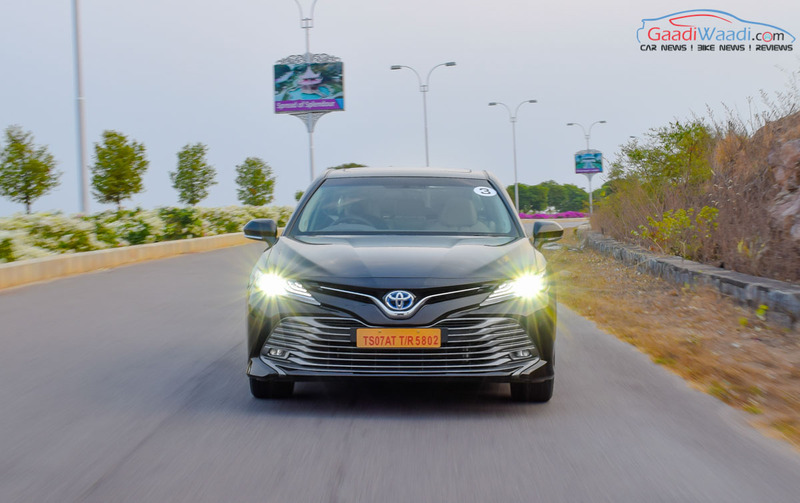 The paddle shifting works a charm and it is smooth in almost all the driving modes that alter the characteristics of the Camry. The Auto Glide Control is helpful when coasting without pressing the new organ-type accelerator. The steering wheel adapts to the power and torque delivery from the petrol-hybrid system. For instance, it loosens up a bit and tightens based on the load conditions. 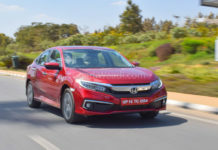 The Sport mode is unarguably the most engaging, as the new electronic power steering gets a little heavy with increased responsiveness compared to Normal or Eco mode. 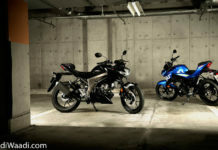 The EV mode is also programmed to perfection as the hybrid system reacts by extracting more juice from the battery when the throttle is not put through agony. 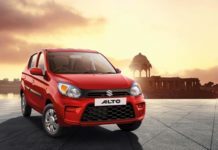 The driving modes are a combination of getting the most out of the petrol engine as well as the battery, and the claimed fuel efficiency of 23.27 kmpl is easily achievable. On gentle tarmac and cruising highways, switching between Eco and Normal modes will make the life a lot easier in terms of fuel consumption. I spent most of my time observing the modes and its impact on handling as well as fuel economy. As obvious as it seemed, the clever hybrid system intuitively configures itself and feeds the power instantaneously. 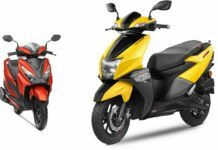 As the IC engine and battery pack work together, you get an adequate amount of power at the tap of the throttle and the engine buzz is largely audible only when driven hard in Sport mode. Toyota made a big deal of the improvements in acceleration right from the outset, and I couldn’t blame them one bit. 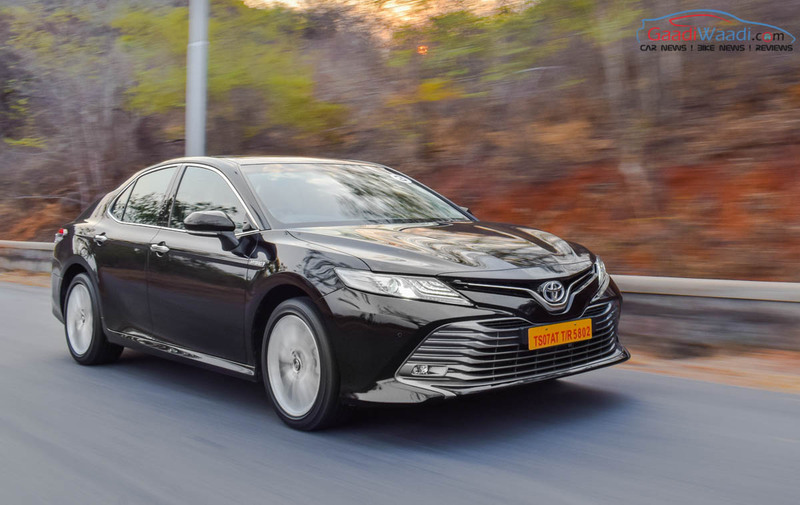 The body roll is very minimalistic and the new front MacPherson strut and rear double wishbone suspension system observes pretty much anything you throw at it making the Camry Hybrid more composed than its predecessor. It is definitely sportier to live with and can respond to quick fly-bys with ease. 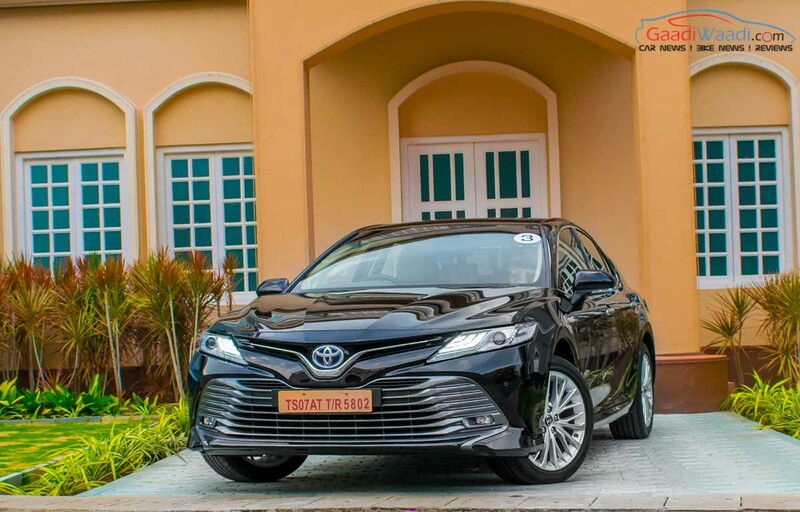 At the end of the day, the Toyota Camry Hybrid in its new avatar has certainly been an impressive package and for a country wanting to shift towards green mobility, the reality is just in front of my eyes. Saying it new is an understatement as Toyota has made every exterior and interior bits of the premium sedan extremely compelling compared to the previous model. For the customers overlooking the smartness of the petrol-hybrid technology and are sceptical about the everyday characteristics of such a vehicle, the practicality factor is the most appealing bit in the Camry Hybrid. 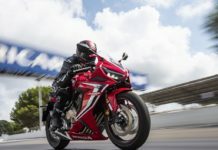 The effortless driving abilities aided by the new TNGA platform is a big hit rather than a miss, and it kind of overshadows the small niggles you could find. 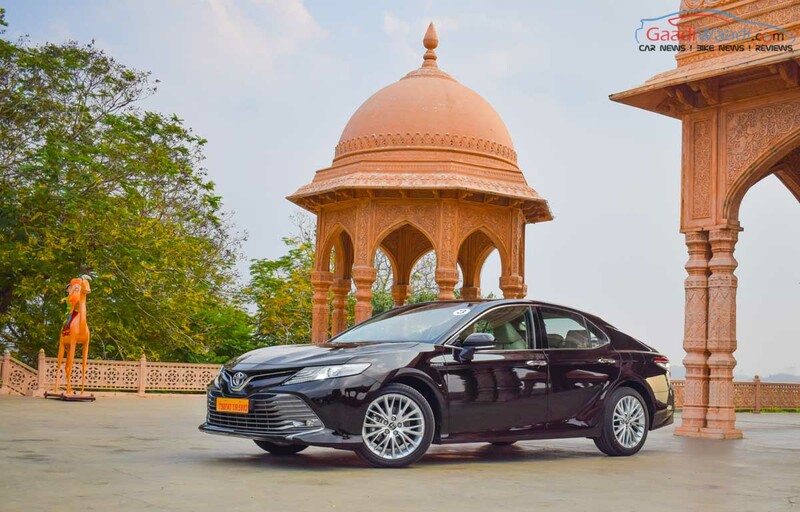 The Camry Hybrid is certainly in my recommendation list for premium sedan buyers who do embrace new innovations and the price point at Rs. 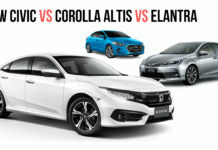 36.95 lakh (ex-showroom, pan India) is bang on and more aggressive compared to the only direct rival Honda Accord Hybrid which costs over Rs. 6 lakh dearer. 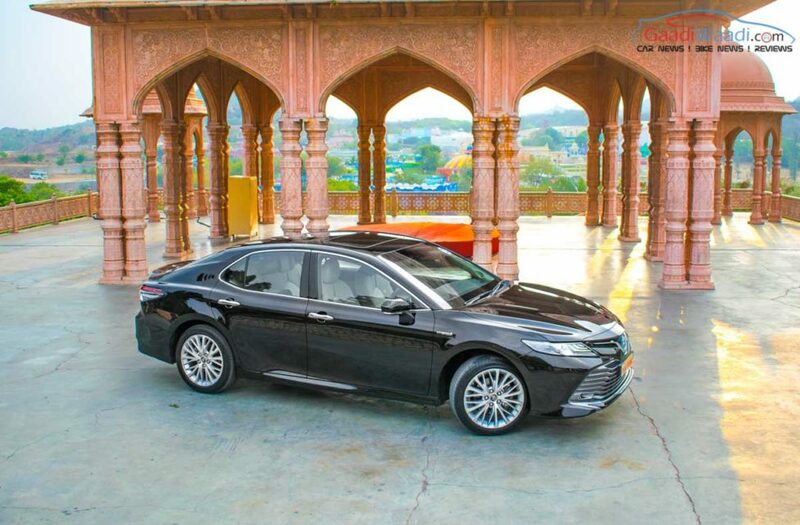 By being the only locally assembled hybrid that shares plenty with Lexus ES 300h, which costs more than Rs. 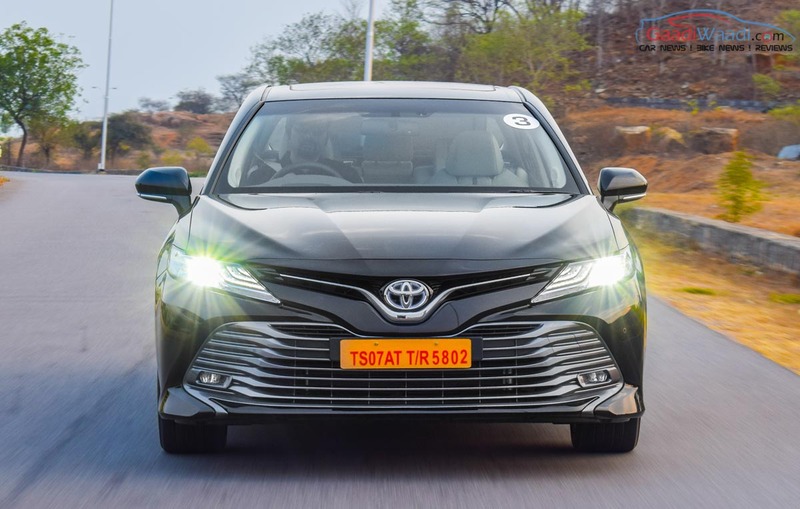 22 lakh extra in comparison, Toyota has taken its choices with the Camry and it won’t just reside at the showrooms as a fancy tech showcase. 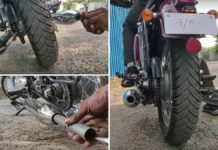 Instead, we will be seeing them on roads more often than ever before!